Safer Society Press, 9781884444791, 52pp. For ages 7 and up. An important new resource for sexual abuse survivors and healing professionals. Sarah is a sexual abuse survivor, and her story is told in the form of a journal. The focus is not on the abuse, but on the healing process, as Sarah overcomes her feelings of shame and anxiety. This look at the feelings of an abused child through that child's eyes can let other victims know they are not alone,and offer comfort and grounding for them. The exercises Sarah uses in the book have been developed by professionals in the field of child psychology. A marvelous tool for helping girls 7-12, especially; it will also appeal to adult women survivors wanting to enhance their own sense of well-being. A triple award-winner. 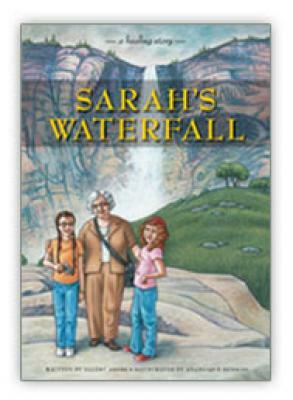 Sarah's Waterfall won a 2009 Skipping Stones magazine award in the Teaching and Parenting Resources Category, a 2010 NAPPA Award in the Parenting Resources category, and the 2010 Mom's Choice Gold Award in the Juvenile Books Self-Improvement Category. "Though Sarah's Waterfall is designed to be accessible to younger readers,its healing message resonates to readers of all ages; adult women in search of a positive healing message for the child within are also well advised to take a look. Highly recommended." --Midwest Book Review. "This book should be in the hands of every professional therapist who works with abused children and in every school and library" --Myshelf.com. "Sarah's Waterfall is a wonderfully sensitive, honest,and poignant depiction of a child's journey toward healing.....It is a beautifully written, thoroughly readable story offering a resounding message of hope and transcendence for children and their caregivers. A powerful, original,and important resource." --Tammy L. Leombruno, M.A., LCMHC, The New England Counseling and Trauma Center. "Sarah's Waterfall is as refreshing as nature itself. .....I can't wait to share this with the kids in my practice." -- Maggie Kline, coauthor with Peter Levine of Trauma Through a Child's Eyes. "Sarah's Waterfall is an exceptionally gentle, sensitive tool to aid in the healing process, with lovely illustrations. " --University of Michigan Health System(Recommended Reading).